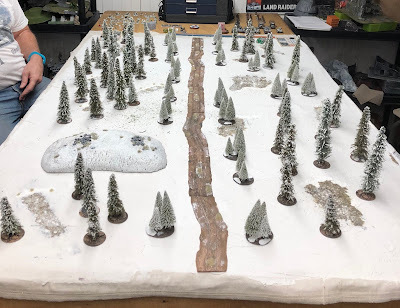 I got together with Tom yesterday to get in another test of Striking Back, an Armoured versus Infantry encounter set during the Battle of the Raate Road in January of 1940. This is the third test now with 3 different experienced CoC players; and the scenario seems to work well. For this third version, I made some minor modifications to the terrain set up, mostly to make it a little simpler. 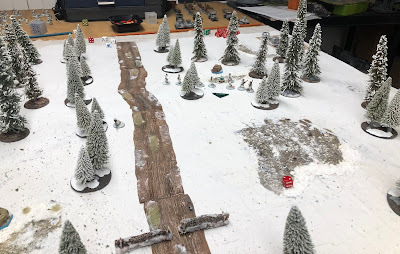 You can find the latest version with the rest of my Winter War campaign material here in my Google Drive. 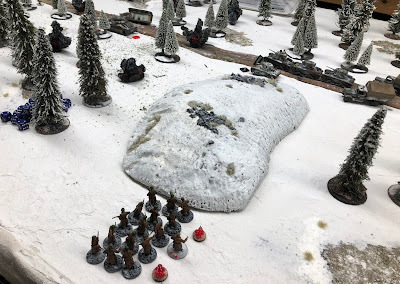 I played the Soviets this time, which was good, I had previously played the Finns twice and in this game I really wanted to focus on the CoC Roadblock rules to see how they would work in the scenario. We have had a lot of discussion on the TFL forum about Finnish Roadblocks and I had decided to go with the rules as written. A Roadblock may be cleared by an Engineer or Pioneer demolition Team. They are equipped with sufficient charges to destroy a single roadblock in a game. To do this they must spend two Phases in which they are activated adjacent to the roadblock during which time they must not lose any members killed or have any Shock inflicted. They must retire at least 9” in order to detonate the charge safely, which requires one further Phase activated. On a roll of 4 to 6 on a D6 they can declare the roadblock destroyed, after which vehicles may pass without hindrance. On a roll of 2 or 3 the road block is partially destroyed and vehicles may pass it but at slow speed only. As you can see this is a pretty tough requirement and although I like winning, I was more focussed on destroying the Roadblock if indeed Tom selected one as a support. I was curious how the process worked. The game commenced with the Soviets going first. 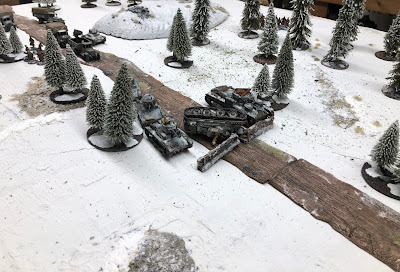 The Finns were not able to advance their JOP's that far up the table. It looks like there is a Roadblock. The cautious Finns start their advance in the forest. 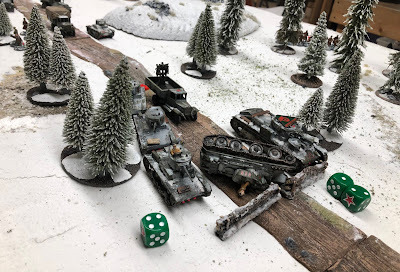 The BT7 rapidly advances to the Roadblock....big mistake. The KhT26 enters. A Finnish Antitank team takes out the BT7, but the Flamethrower tank advances up the verge and they disappear in a puff of smoke. The battle has commenced. 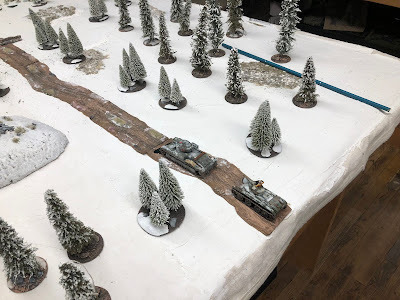 The Soviet commander sends up a Gaz with a SL and a Rifle squad, they disembark and advance to outflank the Finns, they have a tough slog through the deep snow with their average advance being 3"! The T28 advances up to the road block on the verge but gets bogged down! The Finns have launched a mortar barrage. The Soviet slow advance on their left flank. By now the Soviets had pulled back their Flamethrower tank but started to advance their T26 platoon. 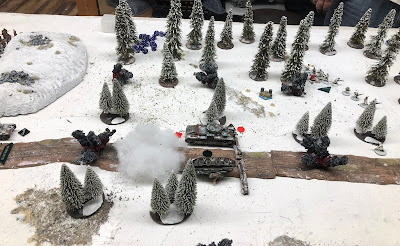 They also send out a 2nd Gaz truck with a second Rifle squad which disembarks and trudges through the snow on their right flank. Time to send out the engineers, you can see them advancing along the road accompanied by a truck mounted Quad Maxim team. 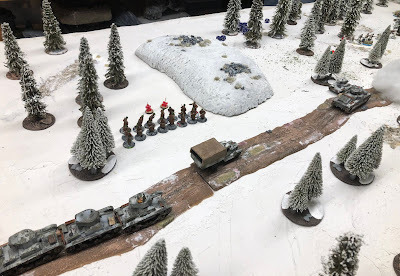 We played that the Soviets could ditch their trucks after their troops disembarked. A real traffic snarl which was my main tactical error. The Quad Maxim had no LOS. 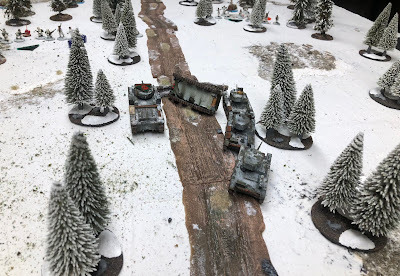 The Soviets despite sending 2 Demolition teams in with the T28 giving covering fire, they get rapidly chopped up by the Finns in the forest. 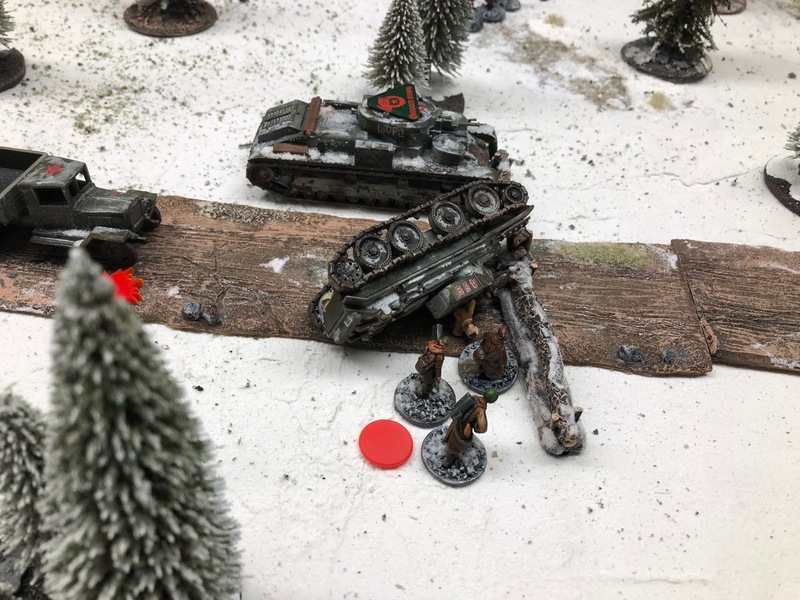 Tom pops another Finnish squad on the table by now the Soviet moarle is 1, time to pull out. Well it was a good game, with the Finns winning with a FM of 5 to the Soviet's FM of 1. All three games have worked well with none of the experienced CoC players offering any major criticisms. All games were close with the Soviets winning the first time around, the second game was very close with a intial Soviet win but a major error was made at the end with the Finnish SL taking a FM test which he should not have taken at a time when both sides FM was 4. 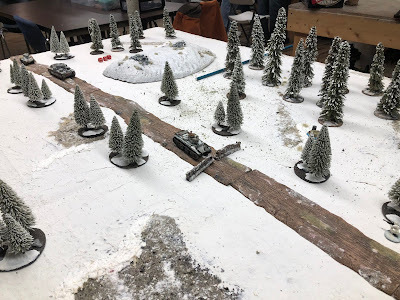 Our game above was a good victory for the Soviets. I certainly made a few errors and Tom played an excellent game, holding back his Finns until he had a good advantage and then disappearing back into the forest. 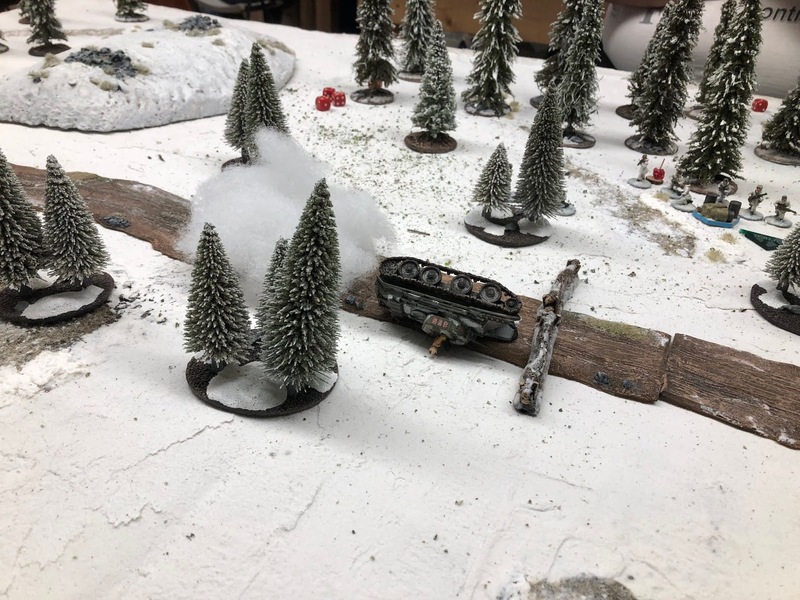 The Soviet player does have a pretty tough time advancing his AFV's up the road. Having a KOed tank blocking the road right at the road block was a major error as it blocked the LOS for the rest of my armour. It also stopped me from giving good covering fire to the demolition squad when it attempted to blow the Roadblock. I have to say though I think it is almost a futile task for the Soviets to take out this road block. 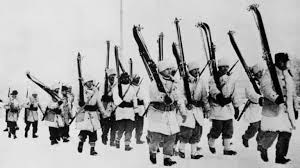 I think I may modify the scenario to give the Soviets an option to take another Rifle squad rather than the Engineering squad but I will give it a bit more thought. I really do not want to enlarge the game as it is already quite big. A very atmospheric looking and feeling game. I like this sort of scenario that makes you feel 'I'll just try one more time'. Always tough having to advance down a narrow road, that was quite the traffic jam at the roadblock. Good defensive play by the Finns, picking their moments to deploy and hitting hard. Great looking table. What a superb looking game! Well done John. Not my era, but a very different and fun appearing scenario. Your winter terrain, troops and vehicles look amazing together, John! Great stuff John - looks outstanding. Great work guys, sold all of winter stuff a number of years ago, looking at your game wished I had not! Atmospheric and beautiful, what a great looking game John!